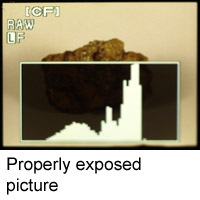 Histogram is a special graph showing distribution of lights and shadows in the image. 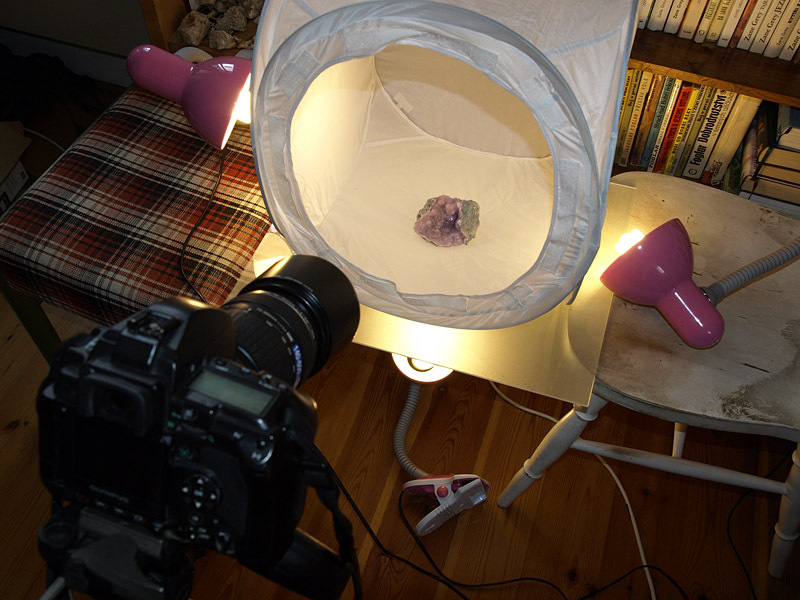 It is the ultimate tool for both exposure metering and picture editing. 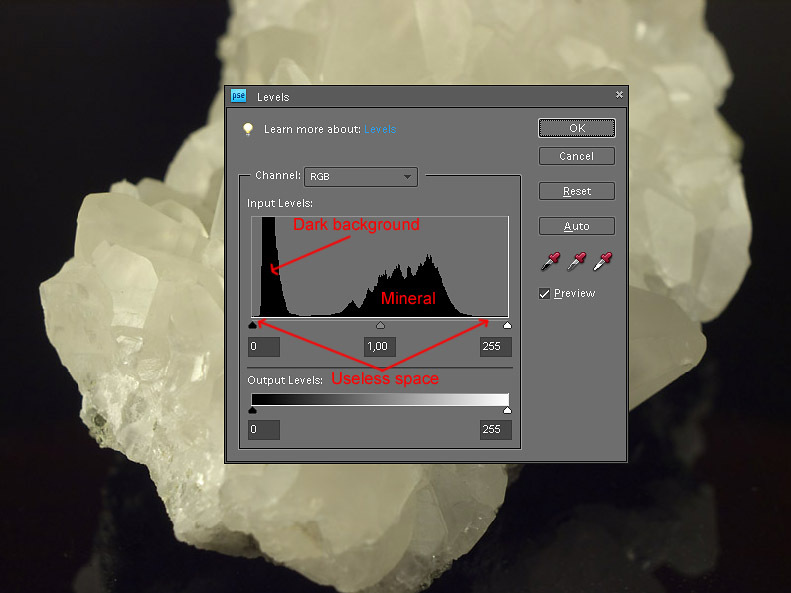 Understanding histogram alone will greatly improve your pictures quality. Histogram is kind of a bar graph. The X (horizontal) axis shows distribution of shadows (left) and lights (right). The most left point is black and goes towards the white on the most right. The Y (vertical) axis shows amount of shadows or lights. 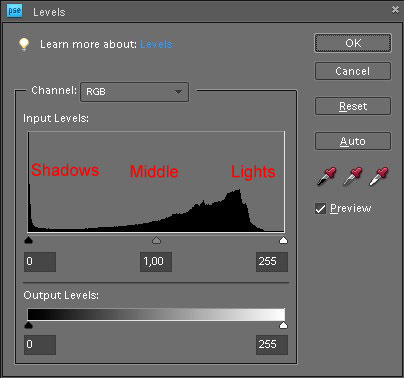 Histogram is very useful tool for evaluating exposure and light and shadows distribution. Histogram works just like any distribution graph with black on left side and white on right side. Everything else is in between. If the histogram looks like one nice heap starting from left bottom, going up and then dropping again to righ bottom, everything is fine. It is not often so ideal and you usually get couple peaks and vawes. The problem starts when the histogram is not at the bottom on both sides. If it is up on the left side or most of the peaks is on the left and just small or nothing on the right, it means the picture is too dark (underexposed) and details are lost in the shadows. Opposite, if most or everything is on the right, the picture is too bright (overexposed) and details get completely white. If the shift to the left or right is not too bad, it could be corrected with tool called “levels”, we will get to this later. However if you get part of the picture completely black or white, it is a major exposure error and you need to reshoot. 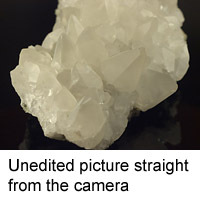 Though there is one exception – pictures on black or white background always result with histogram seriously shifted to left (black background) or right (white background). This is of course not an error and you shouldn’t try to fix it. 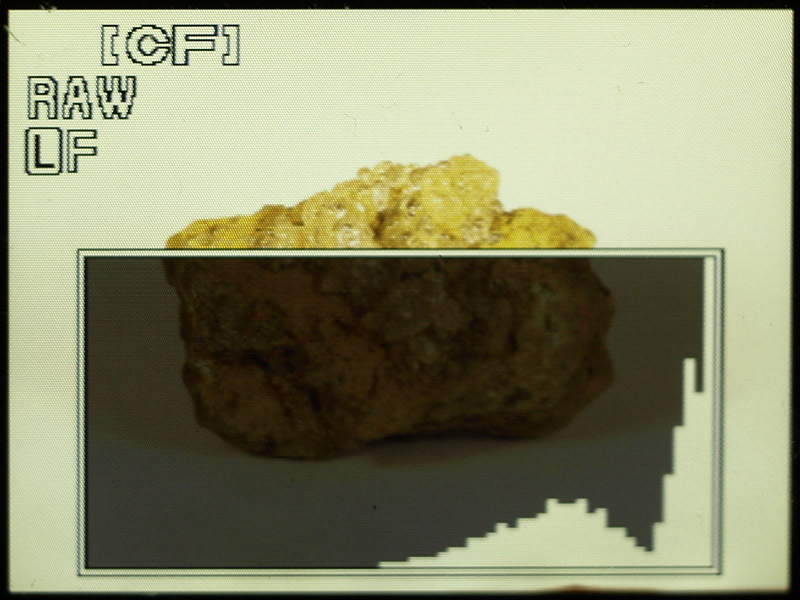 Histograms on camera LCD of various exposures of the same mineral. 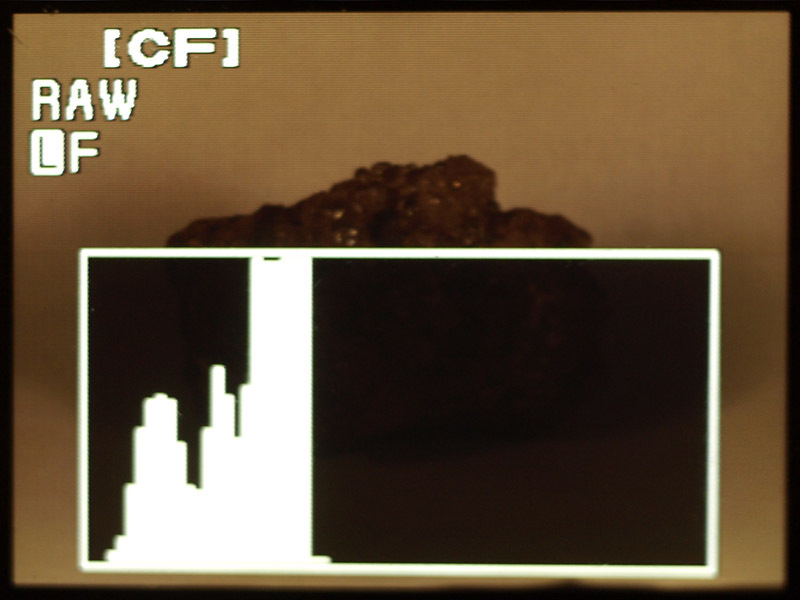 The left one is seriously underexposed, notice big heap in the left part of histogram. In the middle is properly exposed picture. The histogram is not really best one, there are flat parts on both sides. This is hard to avoid while shooting on white background. 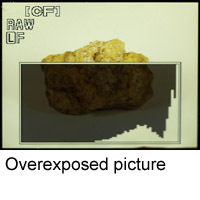 The right picture displays seriously overexposed picture, notice big heap in right part of the histogram. Histogram is very valuable for evaluating exposure. Most of current “sun-resistant” LCD screens on cameras have still very poor performance in direct sunlight. They also have very poor dynamic range and shortly what you see on LCD is definitely NOT what the picture looks like in computer. 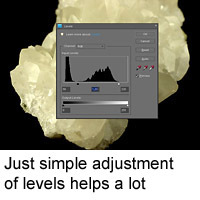 Most cameras have histogram option which helps you to make correct exposures. 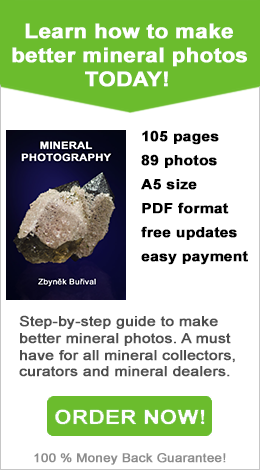 Especially shooting minerals is very tricky and often fools camera automatic exposure metering. 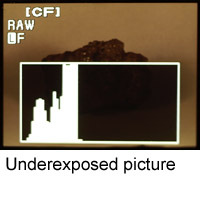 Turn the histogram on and you can instantly evaluate exposure. It is much easier to check exposure immediately during shooting and instantly correct wrong metering then trying to restore bad pictures later or wasting time on reshooting all the bad pictures. 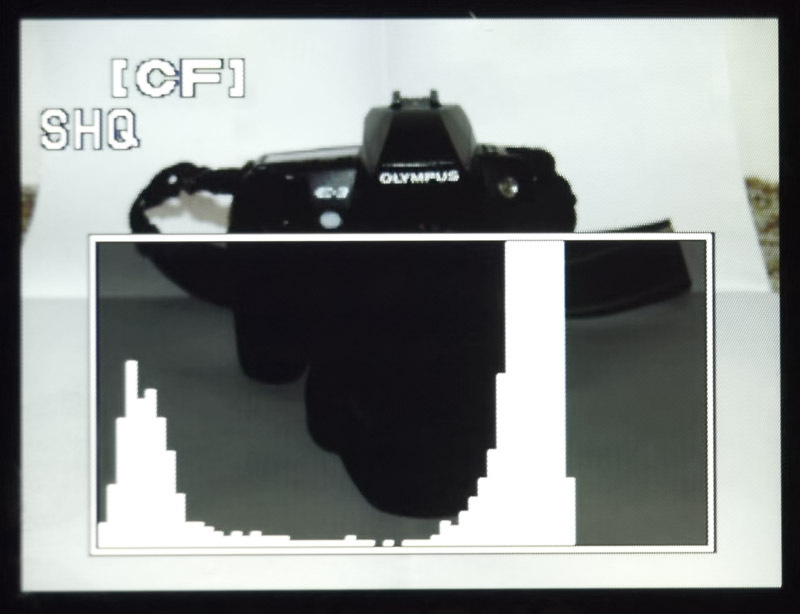 Example of histogram on my DSLRs screen in picture view mode. This allows me to immediately see exposure problems. For example this one is a bit underexposed and I need to set exposure correction +0,3 EV to fix it. Histogram also helps you with editing pictures. Check it often to avoid too much lights or shadows clipping. Or use it to clip where you want. The tool used for editing is called levels. 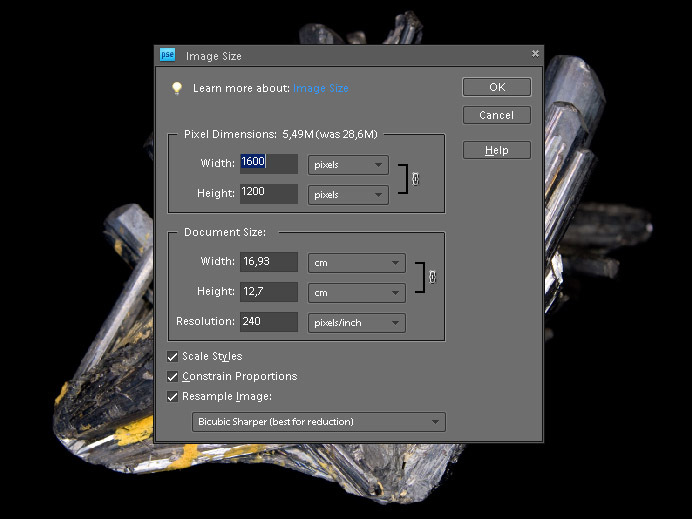 You can open Levels dialog box with shortcut Ctrl + L or use menu Enhance -> Adjust Lighting -> Levels in Photoshop Elements 8.0. Same shortcut works for Photoshop but the menu goes Image -> Adjust -> Levels. Levels look like histogram but you can move three sliders to adjust the picture. 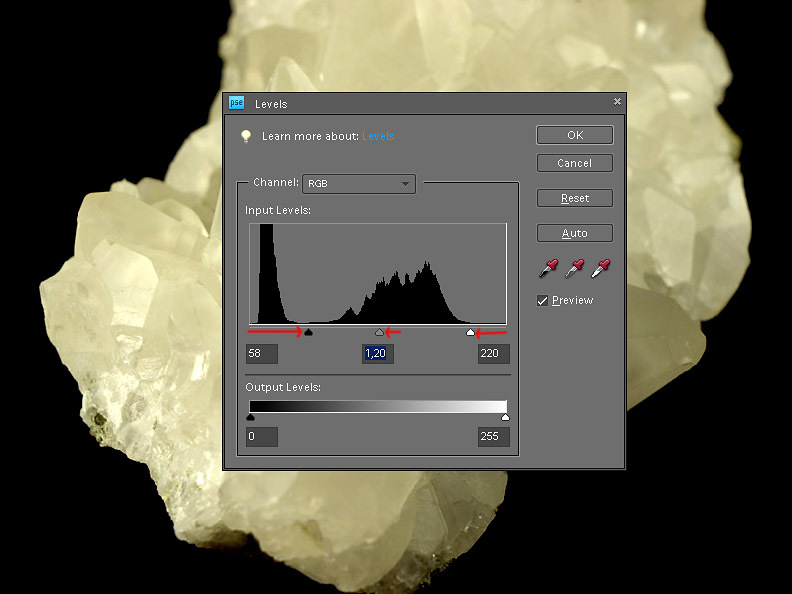 Tool called levels will help you fix your pictures. On the left is straight from the camera picture, on the right is the same picture with opened levels and visible histogram. 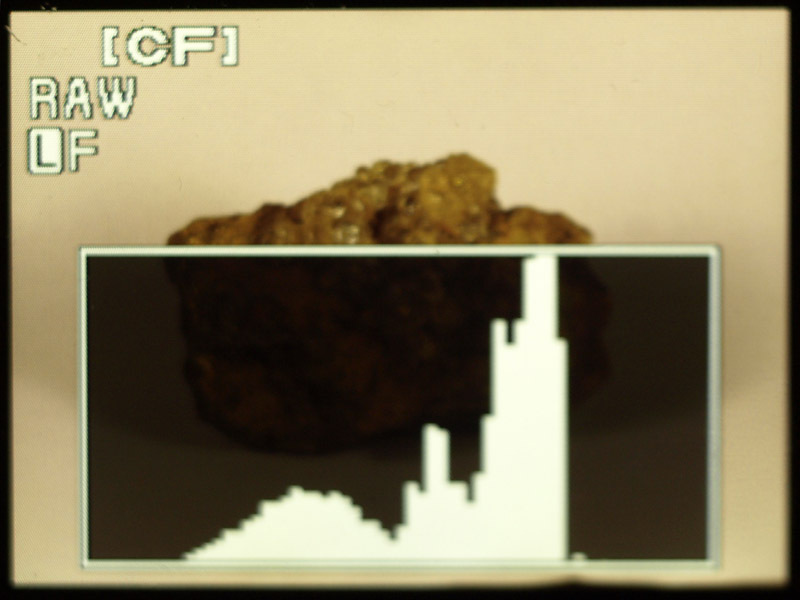 Click on the right picture to see detailed description of histogram. Moving left slider to right means darkening the picture, the most dark areas become darker and darker and if you shift too much, you begin to clip details and they become totally black. Right slider works opposite way for the white. So moving it to the left means making the colors lighter and if you shift too much, details get completely white. The third slider in the middle can adjust total brightness of the picture. Moving to left makes the picture darker, moving to right makes the picture lighter. 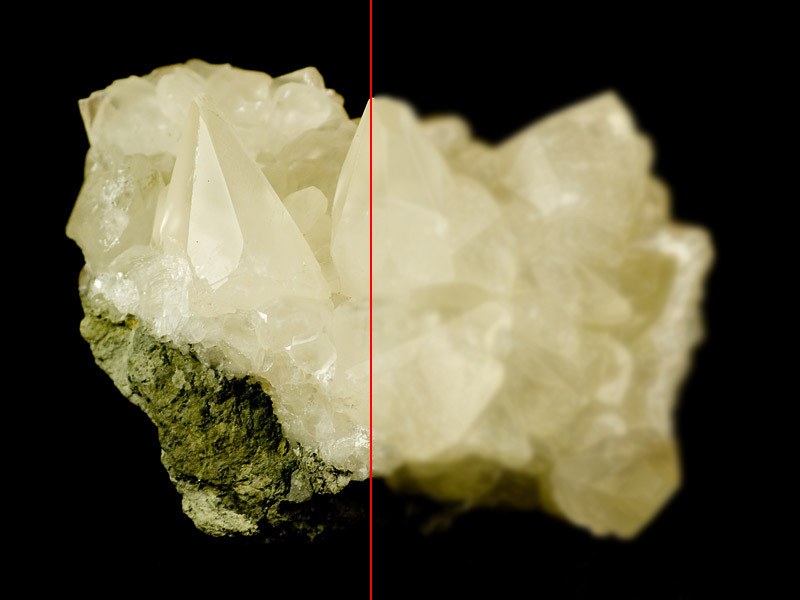 On the left is adjusted picture after using levels, on the right is the same picture with opened levels and visible histogram. Click on the right picture to see detailed description of what I did to fix it. Using levels needs some practice. 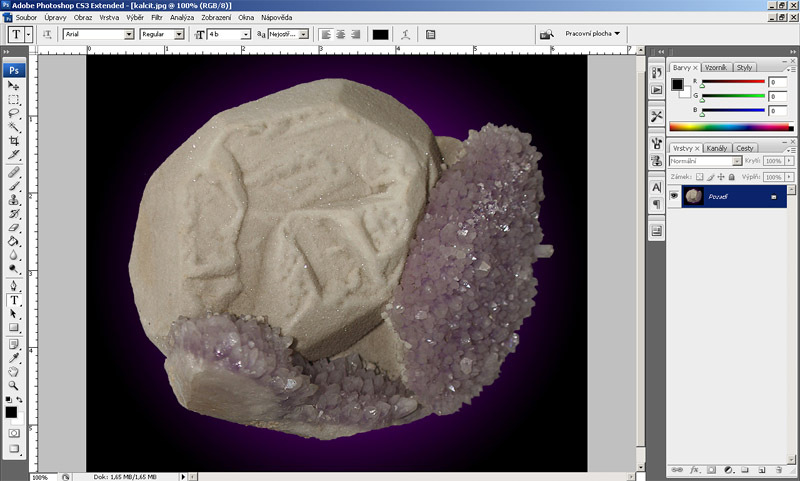 You can download rough picture from example above and try editing it. Move sliders and see what happens, own experience is best to understand the problem. You can check fixed histogram to see how I adjusted the sliders. 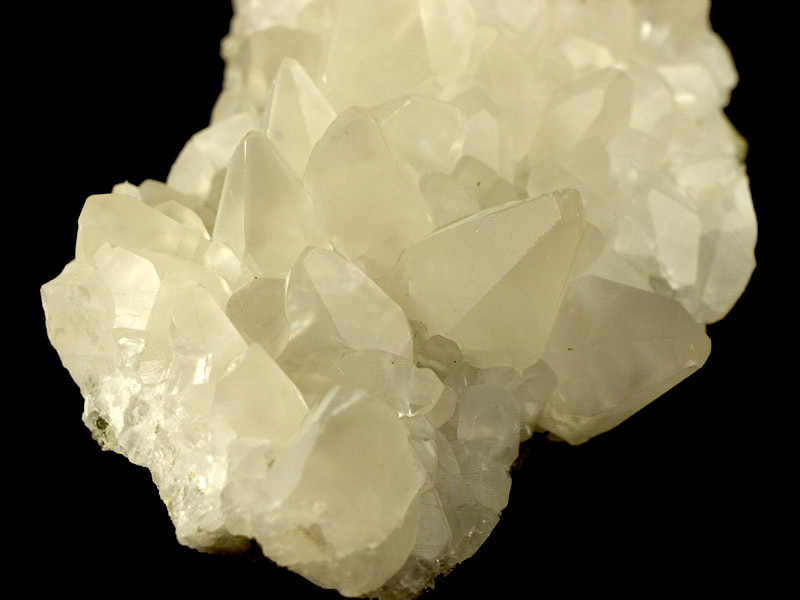 Especially mineral pictures on solid background need some levels adjustment. You can highly improve your pictures with just few clicks, let’s go and try it!